It’s 1939 and Hollywood is abuzz. Legendary producer David O. Selznick has shut down production of Gone with the Wind because the script just doesn’t work. While fending off the film’s stars, gossip columnists and his own father-in-law, Selznick sends a car for famed screenwriter Ben Hecht and pulls director Victor Fleming from the set of The Wizard of Oz. Summoning both to his office, he locks the doors, closes the shades, and on a diet of bananas and peanuts, the three men labor over five days to fashion the screenplay that will become the blueprint for one of the most successful and beloved films of all time. 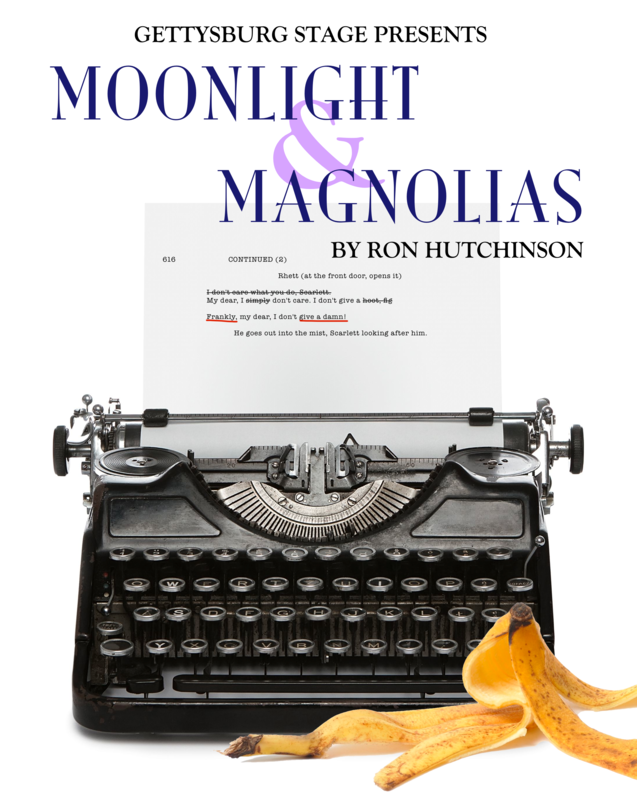 Moonlight and Magnolias is a rip-roaring farce written by Ron Hutchinson, and directed for Gettysburg Stage by Mark Franceschini. Bringing the vision to life are Jeb Beard as movie mogul David O. Selznick, Michael Baker as famed director Victor Fleming, Ryyn Currey as screenwriter Ben Hecht and Rebecca O’Leary as their long-suffering secretary, Miss Poppenghul. This entry was posted in Past Performances. Bookmark the permalink. Please check back with us for audition announcements.